Does your chicken Chicken Parmesan need a little Sriracha? Too bad you're at work, and all the office kitchen has is packets of salt and pepper. Until now. Sriracha2Go teamed up with Huy Fong Foods to create the first ever individual Sriracha packets. 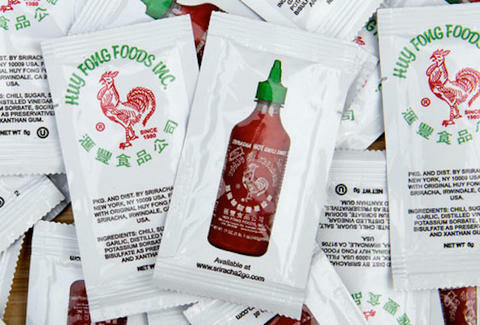 Picture this: ketchup packets, but instead of ketchup, Sriracha. What don't you get about this? As Sriracha2Go reported in its blog, "We believe that Sriracha should be as readily accessible as all other core condiments." Exactly. The company hopes to distribute these packets just like their now-much-less-attractive sister packet, the ketchup, and bring them to restaurants, fast food chains, stadiums, and campuses soon. No word on exactly when this is happening, but until then, you can purchase packets on their website. Soon everyone will have drawers full of Sriracha instead of Taco Bell Fire Sauce, and that weird Chinese restaurant duck sauce. Well, maybe there's drawer space for everyone. But now you'll have Sriracha, too! Kara King is a News Writer at Thrillist and can finally stop carrying her bottle around. Send news tips to news@thrillist.com and follow her at @karatillie.